Any post-Christmas advantages that we can take to improve our brain power are sounding real good about now, especially because it’s exam and revision time. There are plenty of ways to keep our brains sharp; from getting enough sleep, to smiling and laughing. However, it’s how we fuel it with food that might be the most important of all. Below you’ll find a bunch of healthy food tips that’ll keep your brain alert and ready to smash that revision! (Or at least drag yourself through an all-nighter). Not a shocker here that fruit is the first thing to be mentioned. Of course all fruit is good for you, but some are much better than others when it comes to boosting your brain power. For example, it’s said that a banana contains the exact amount of glucose your brain needs to work at its optimum level. What you really need to look out for though, are berries, in particular, blueberries. Not only are blueberries good for the brain, but apparently the antioxidants within those little blue wonders can even reduce signs of stress on the brain and combat age-related conditions. Oily fish is supposed to be the best for our noggins, with salmon leading the way. 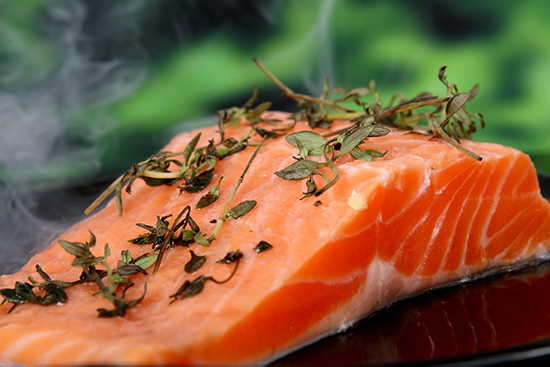 Salmon contains protein, iron and vitamins that all contribute to improved memory, recall, focus and thinking. Salmon is also rich with fatty acids too. This sounds like a bad thing, but actually because the brain is made up of a lot of these fatty acids, they need topping up frequently. So really, it’s the fattier the better! Well if fruit was going to make the list their slightly less attractive cousin, vegetables, was sure to make an appearance too. Keep a look out for kale, spinach and broccoli. These dark, leafy greens are high in B vitamins which all aid in the brain’s functioning, as well as iron, which brings more oxygen to the body and brain. A lot of people are put off by veggies as they think they’re tough to prepare. But this doesn’t have to be the case. For some of the healthiest (and easiest) results, get a hold of a steamer. Although, experts go back and forth on the perfect method, steaming allows the important nutrients to be locked in and taste great too. All you have to do is stick some water in the bottom and leave on a low heat or microwave. Job done! Although nuts and seeds may seem insignificant due to their size, they can make a bigger difference than you think. Just a handful of pumpkin seeds can give you the daily recommended amount of zinc, which focuses your memory and thinking skills. Meanwhile, nuts, and in particular walnuts, are said to not only improve your memory but also prevent it from declining in older age. They’re also great for keeping your blood pressure low too, which can be really important over stressful periods like exam times. While it’s super important to eat right, you can’t forget to drink right too! Personally, I’m awful at drinking enough water and when I am thirsty a can of pop is just too tempting. However, when you consider that water makes up around 60% of our bodies, replenishing it up is crucial. A good trick is to fill up a large bottle of water and keep it with you while you study, especially if you work in a warm environment. This way you won’t have to keep remembering to run off to get a glass while you’re trying to work. Finally, you should remember there are also certain foods you should definitely avoid. Salty foods, such as crisps, are just going to dry you out, which can lead to headaches and loss of focus. On the other hand, really sugary food or drinks only give you a temporary kick and then leave you to crash later on in the day. Avoid energy drinks! Energy drinks contain many acids such as taurine, which, when taken in high amounts, can be very detrimental to your health. Also, sad as it is to say, lay off the pizza. Heavy and fatty foods like this are only going make you feel lethargic and unmotivated as the body needs a lot of energy to process them. Hopefully with some of these healthier options on your shopping list your brain power will be sky-high! I know it’s stressful but you need to make time for food. Your mind and body will be so much worse off if you avoid fuelling them altogether.